Verlin "Lee" Lehman became interested in his great uncle, Albert Kadura, while researching his family genealogy. He found on a branch of the old family tree an intriguing mystery about the circumstances surrounding Albert's coming to Red Rock, Texas from Germany at age 17, and then subsequently disappearing within two weeks of his arrival. With the tenacity of a blue tick hound dog after a raccoon on a cold winter moon-lit night, Lee spent several years researching and coming up with personal interviews and documentation that clears up some of the mystery surrounding the disappearance and subsequent life of his great uncle, Albert Kadura. His research included three trips to Wyoming - one in 1994, another May 15 - 22, l997 with Dennis Bartsch, and a final trip in 1998. The information below, concerning Albert's European roots, was taken from Marian H. Nelson's book, "Vester". 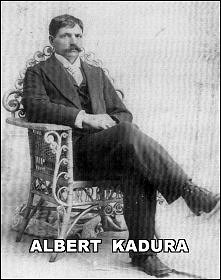 Albert Kadura the oldest son of Joseph Kadura (Katura) and Carolina Schubert was born on 8 August, l862 in Wangern, Prussia which is today Wegry, Poland. His father Joseph born on 30 May, 1834 in Wangern, Prussia died on 26 October, l902 in Rockne, Texas. Albert's mother, Carolina Schubert, born 1 January, 1838 in Breslau, Germany which is now Wroclaw, Poland died 18 January, 1927 in Rockne, Texas. Both of Albert's parents are buried in Bastrop County in the Sacred Heart Church Cemetery in Rockne, Texas. Albert's parents, Joseph and Carolina immigrated to the United States arriving in the Port of Galveston on 19 December, 1871. They apparently left Albert who was eight and his younger brother Martin, age six, in Germany and brought their five daughters Annie born 1965; Martha Marie born 1 December, 1866; Augusta born 15 June, l866; Alvina born 30 July 1871; and an unidentified two year old daughter born in 1869 who died on the voyage. After arriving in Red Rock, they had two sons, Paul Kadura born March 30, 1874 and Joseph born February 24, l878. Albert followed them to the United States in 1879 when he was 17 years old. Where he lived during the six years he remained in Germany before emigrating is not known. Joseph and Carolina were German, Catholic people with deep religious convictions. So it would only be reasonable to assume that Albert, their oldest son, was baptized in the church in Wegry. This being the case, it is difficult to explain how all of the records found by Lee Lehman in Wyoming which ask for religious preference indicate "none". Also the records state that Albert had no education although he could read and write. When he returned to Rockne in 1920, he was seen attending Sacred Heart Church with members of his family. When Albert arrived in Rockne at the age of 17, he stayed only two weeks and then left abruptly. The story goes that he came in from the field with a team of mules, tied them up under a tree and left without saying a word. His family apparently did not hear from him until sometime after 1917, because his mother signed a statement in l917 saying that she had not heard from him in over thirty years. The statement was made when her land was being divided among her children. Sometime after that, Albert apparently wrote a couple of letters to his brother Joseph Kadura and his sister-in-law, Mary Kadura. Mary must have written to him telling him about his father's death and the fact that he had inherited some land because he returned to Rockne in 1920 to collect his share of the estate according to records in the Bastrop County Court House. Albert's niece, Isabella Kadura (Sr. M. Rosamunda, CDP) born 16 February, 1913 and seven years old at the time Albert returned to Rockne, says she remembers his visit. According to Sister Rosamunda, he was a good looking man dressed in nice clothes and very friendly. She remembers him giving her a nickel and giving her and the other children candy. She also remembered her mother, Mary Kadura, telling her that Albert had changed his name from Albert Kadura to Al Propst, and that he lived in Split Rock, Wyoming. During this visit, Albert told his brother Paul's son, Albert (Archie), who was twenty years old, that he was a horse trainer and an outlaw. The younger Albert related this story to Lee Lehman when he was 14 years old and then again when Lee was an adult. Mary Anna Goertz, the daughter of Joseph Kadura, Albert's brother, remembers her father bragging to Albert about her hand writing. She recalled her father having her write one or more letters to Albert in Wyoming. Mary who was born in 1908 would have been 12 when Albert visited in l920. She also recalls him coming to visit more than once. There is no record of how Albert got from Bastrop County to Split Rock, Wyoming. All of the documents relating to Albert indicate that he worked as a cowboy and horse trainer so possibly he hired on with a trail driver taking cattle to Wyoming. His uncle was in the cattle business and drove cattle out west. This may have been the connection. During that period of time, circa 1879, herds of Texas Longhorns were being driven to Wyoming to stock ranches being developed there. It is not likely that a 17 year old young man with little or no money and who couldn't speak English would have gone by train and stage coach to Wyoming. The first record of Albert's activities, after leaving Red Rock, occur fourteen years later in November 1893 when he was incarcerated in the State Penitentiary at Laramie Wyoming. The following information was taken from a form called the Description of Convict. The name he was using at that time was Al Propst, and his crime was assault with intent to commit robbery. He was convicted and sentenced at Sundance, Wyoming in Crook County on 3 November, 1893 to four years in the state penitentiary at Laramie. He gave his age as 31, and indicated that his home of record was Red Rock, Bastrop County, Texas. He listed his occupation as a cowboy. The description given of Albert is that he was 5 feet nine and one-fourth inches tall, weighted 170 pounds, his hair was dark brown, and the color of his eyes were hazel. The record further states his education was poor, and he was intemperate. It was on this record that he gave his father's name as Joseph Propst, and his mother's name as Mary Propst of Red Rock, Texas. This of course was false, his father's name was Joseph Kadura and his mother's name was Caroline Kadura. Both Joseph and Caroline were alive at this time, and they did live on a farm near Red Rock, Texas. Why he gave the names of his parents as Joseph and Mary Propst is unknown. One could speculate that he was left with a family named Joseph and Mary Propst. The Probst family in Rockne came from Kospendorf, Schesien, Prussia which is only 30 miles from Wangern, Prussia where the Kadura's had lived. Perhaps there is a connection. In German the p and b are often interchanged in words so this may be the same name. The Atlas of Wyoming-Outlaws at the Penitentiary on Page #148 has the following: Al Propst - November 10, 1893. Assault with intent to rob - Crook county. Sentenced to 4 years, age 31, cowboy, Red Rock, Texas. Parents at Red Rock, good conduct. Released on April 11, 1897 with good time allowed. Convict served 3 years and 5 months. Harry Longabaugh, alias the Sundance Kid, was convicted of stealing a horse in 1887 in northeastern Crook County, Wyoming. He served 18 months in Sundance, the county seat of Crook County where Al Propst was subsequently arrested in 1893. After being released the Sundance Kid joined Butch Cassidy and his gang at his hideout at Hole-in-the-Wall near Kaycee, Wyoming. This large gang robbed trains and banks all over the west. The robbers had their get-a-way well planned with fresh horses waiting at strategic places. Speculation has it that Al Propst was a member of this gang prior to his arrest in 1893 and trained and furnished horses for them. Speculation is based on the conversation Albert had with his nephew Archie about being an outlaw. Less than three years after being released from prison Al Propst was arrested for holding up a store. When Lee Lehman was in Wyoming in October, 1998 he obtained excerpts from a lecture that Professor Leon Baker used in his classes on Western Outlaws. It is as follows: "At 8:00 p.m. on Jan 3, l901 a rifle toting figure entered the Cosgriff Bros. Store at Medicine Bow, Wyoming. He had a red bandanna tied over his head with a narrow slit cut in it so he could see. A horse blanket was draped over his shoulders, which with the bandanna mask made him very hard to describe. Once inside our robber, Albert Propst, weapon in hand, covered general Mgr. A. R. Cousins, local manager N. H. Scott and a bookkeeper Devine and demanded all their cash! Throughout the robbery the masked figure repeatedly shouted out orders to associates who were supposedly waiting outside. Propst got $45.00 from the store and $75.00 personal cash from Scott. Then he fled into the night firing a few warning shots. At the turn of the century the robbing of one or another of the various Cosgriff Bros. Stores was a fairly common occurrence with one being victimized about every 4 to 6 months. This hold up was different. The bookkeeper correctly surmised that they had been robbed by a very imaginative lone bandit. He grabbed up the only gun he could find, a 5 shot Topbrun 32 revolver and chased out into the street firing at the fleeing hold-up man. Thanks to the ruckus he raised, a crowd gathered and vigilante posse formed. The bookkeeper's hasty pursuit also fowled up the Al Propst escape plan. Losing his nerve he fled to the home of stockman Richard England for whom the novice robber, had been herding sheep. He would leave his blanket and rifle with England. Confessing to the crime he offered to cut England in on the $120.00 if his employer would keep quiet. England was non committal but convinced Propst to go to his cabin and get some sleep while he, England, would consider the offer. Instead England kept watch on Propst all night and through the cabin window he saw the robber count his loot. Meantime word of the robbery had been telegraphed out and as Sheriff McDaniel was already bound for Hanna he continued on to the Medicine Bow to take official charge of the search. Early the next morning England had made up his mind, he turned Propst into the sheriff. The sheriff immediately brought the suspect to the county jail where he and McSwain, an accused murderer were incarcerated together. Only 90 some odd dollars of the stolen money was recovered. Later in District Court without any explanation as to what happened to the rest of the money Al Propst pled no contest to the robbery charge. By June 15th he was sentenced to 12 years in the penitentiary. The 39 year old self professed cowboy from Red Rock, Texas began his 2nd hitch in the Wyoming State Penitentiary on June 16, 1901. Back in 1893 he had been sentenced to 4 years for assault with intent to rob from Crook County. He then served 3 years and 5 months getting time off for good behavior. This time he'd do 6 years and 11 months before getting a full pardon from Governor Bryant B. Brooks on May 9, l908. During the time they were in our county jail awaiting their separate trials in the June session of district court McSwain and Propst gave the county some more excitement. At 8:00 p.m Friday April 19th the pair plus two other accused felons, James McMahon and Thomas Martin, waylaid county jailer George Hiatt and escaped. Somehow the foursome had obtained a means of cutting off one of the �" rails that separated the corridor in front of the main cell block aisle. This gave them enough room to crawl through and wait for the jailer to come through the main door into the cell block. When Hiatt entered for evening lock-up they sand bagged him with a home made sack which held a lump of coal. Hit from behind Hiatt fell to his knees. In an instant Martin was choking him while Propst took his gun! The other three stopped Martin from killing Hiatt wanting him for a hostage but when they ordered Hiatt back into the jail office he stubbornly refused to move. So the jail breakers took his keys and locked him in the block. Then they fled into the cold spring night only in their light jail garb. Hiatt meanwhile began hollering and pounding on the cell block door. He attracted the attention of Deputy County Clerk Watson and County Treasurer Pratley who were working late in the court house. They summoned Senior Deputy Horton who released the jailer. Sheriff McDaniel was still out of town so Horton hastily put out word of the escape and organized a posse. Meanwhile fleeing on foot the escaped convicts split into pairs, one pair going west and the other going east out of town. McSwain and Propst went east and were caught the following Monday April 22nd three miles east of the old George Ferris ranch on the Platte north of Ft. Steele. The others went west only a short time before doubling back and soon wound up in the same area near the old Ferris ranch. McMahon was taken the morning of the 25th while raiding Cosgriff Bros. Sheep camp for food. Martin who by then had struck out on his own managed to elude capture for some time. But for our two principal characters the episode was finished and their days of freedom over. The Atlas of Wyoming-Outlaws at the Penitentiary on Page #228 has the following: Albert Propst - June 16, 1901. Robbery (Held up employees in a store in Rawlins), Carbon County sentenced to 12 years, age 39, cowboy. Texas family in Red Rock, Texas. Remarks: Convicts second time in penitentiary. Having served a term in 1893, as convict #148. Good conduct, early release on February 11, l908, by Governor Bryant B. Brooks to 11 years. Released with citizenship restored on May 9, l908. Convict served 6 years and 11 months. Sixteen years later the Fourteenth Census of the United States: 1920 - Population says the following about Albert Props (Notice the "t" has been dropped from the name): Albert Props, male, white, age 56, single, no education, can read, can write, place of birth - Texas, fathers place of birth - Germany, mothers place of birth - Germany, place of occupation - McIntosh ranch. The McIntosh ranch is located on highway 287 between Muddy Gap and Jeffery Wyoming. There is every reason to believe that Al Props did work on the McIntosh ranch at this time. When he returned to Red Rock, Texas in 1920 he gave his address as Split Rock, Wyoming. There is a huge split rock on highway 287 two miles from the McIntosh ranch. The historical marker nearby says that wagon trains going west would split here at this rock either going the southern trail or the northern trail. When Lee Lehman visited the McIntosh ranch on 17 May, l997, the present owner Virginia McIntosh said her husband had told her "Old Al Props" captured wild horses on the red desert in the vicinity of Wamsutter, Wyoming and tamed and trained them. She further said that she heard her husband say that Al had a homestead, was a quiet man, and was never married. Wamsutter where Al Props supposedly had a homestead is a small town on Interstate 80 some 30 miles west of Rawlins, Wyoming in the south central part of the state. As the crow flies it is about 40 miles from Wamsutter to the McIntosh ranch. The red desert is in between the two. It would have been quite easy for Al Props to have worked the southern portion of the McIntosh Ranch and trapped and trained horses in the Red Desert. Albert Props died in the Rock Springs, Wyoming General Hospital on 7 April 1941 at 10:00 p.m. Rock Springs is on interstate 80 some 60 miles west of Wamsutter. His Certificate of Death had the following information. He died of Cardio-renal disease at the age of 78 years, 7 months, and 29 days. It listed his place of residence as Wamsutter, Wyoming in Sweetwater County. His occupation is listed as a cow hand and his place of business at the McIntosh Cattle and Horse ranch. Al Props obituary reads as follows: "Props Services Will Be Today. Funeral services for Albert Props, 89 (actually he was 79) year old Wamsutter resident who died at the Wyoming General Hospital will be held at Rogan chapel at 2 o'clock this afternoon with the Rev. E.L. Tull, an Episcopalian, officiating. Burial will be in Mountain View Cemetery. Props had been a resident of Wamsutter vicinity for about 35 years. He is survived by two brothers in Red Rock, Texas. Rogan mortuary is in charge of arrangements." A Funeral Record from the Frank P. Rogan's mortuary revealed the following additional data not listed in the death certificate: Al Props funeral was charged to Welfare. It also said that Albert had a no. 112 Greyette casket which cost $60.00 that was paid for by the County. It listed his employer as Bill McIntosh, and that he was buried in Rock Springs, Wyoming at the Mountain View Cemetery. This cemetery is now named the Rock Springs City Cemetery, and Albert Props is buried in the County section, ID number 103-142-004-003. If Al Props spent 35 years in the Wamsutter vicinity, it indicates that he came there shortly after his release from prison in 1908. A 79 year old man in Jeffrey City said he knew of Al Props and that he trapped and tamed wild horses, lived in a dugout, and rode with a half Indian friend. Jeffrey City is very close to the McIntosh ranch which would have been Al's stomping grounds. There's a lot of mystery and intrigue about Albert Kadura. Where did he live the 10 years after his parents left him in Germany? Where did he live the 25 years before working on the McIntosh Ranch? No evidence was uncovered as to whether he in fact owned any real property. Was his dugout somewhere on the 1.5 million acre McIntosh Ranch? Albert Kadura's journey from the Confederation of German States to the wilderness of the west to a lonely unmarked grave is not a unique story. Our forefathers could tell us many similar stories and this is the legacy they leave us that we dare not forget.